Those of you who have flown 2-33, N36135 may have noticed the name Bruce Helvie adorning the fuselage under the cockpit. Who was this guy your might ask, and why is his name on the glider? Well, here’s the answer to that question, from John Antrim. Bruce left the glider club in the late 90’s and many of the old timers where there to attend his last take off. His wife Gladys of many years survived him. Bruce left a portion of his estate for CCSC as a memorial. His long time friend Wally Detert spent many hours in Cubby’s hangar (a labor of love for a master craftsman) restoring -135 to a “better then new state.” Wally selected the green color for the fuselage for reasons only he knows, and he’s keeping the reason secret. 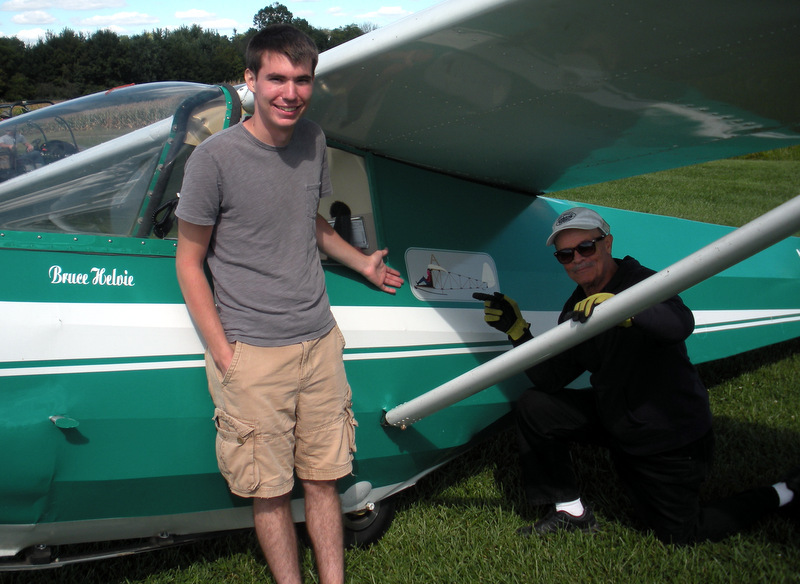 Zach Siefker and Bill Gabbard point out the decal from John Antrim’s sketch of a “general primary glider”. The glider depicted on the decal is a “general Primary Glider”, a sketch made by Antrim that represents a composite of numerous photos and drawings of Primary Gliders of the period. The transfer was generated by professional artist Dennis Kirby at his Custom Vinyl Graphics business in Lebanon Ohio from John’s sketch. Bruce and the late Joe Bearden were both instrumental in promoting the sale of a 1-26, S/N 336 to the newly formed Red Wing Soaring Club in 1966. Bruce was our inspirational leader and checked out all of us before we could solo 336. (A model of this glider hangs in the clubhouse.) Bruce learned to fly at a club in Akron, Ohio, in the 1930’s where he soon became a legend. He was quite proud of Wilber Wright’s signature in his logbook. You may know that Akron is the home of the Goodyear blimps. The latest “blimp” is now a rigid structure dirigible configuration considerably longer, faster and more maneuverable then the original semi-rigid blimps, which are all scheduled for retirement in the near future. The huge hangars that housed these early dirigibles are still standing today. It is claimed that the Akron hangar was used for a form of ridge soaring by Bruce and other members of the Akron Glider Club. In addition, the blimps were used at air shows for towing the club gliders, in fact 3 or 4 gliders at a time. Years later Bruce was to repeat the multiple tow of 3 or more 1-26’s simultaneously. Bruce was also a WW II USAAF glider instructor at 29 Palms, CA. They flew a wide variety of gliders, SGS TG-2’s, TG-3’s and a weird one, a three-seat conversion of an Aeronca Defender (sans engine), i.e. 2 students and Bruce as instructor. He also flew one of my all time favorites, the Fairchild PT-19 as part of his instructor checkout. It was/is a dream to fly for sure, right up there with the Stinson L-5 that SSD used as tow planes while at Richmond.